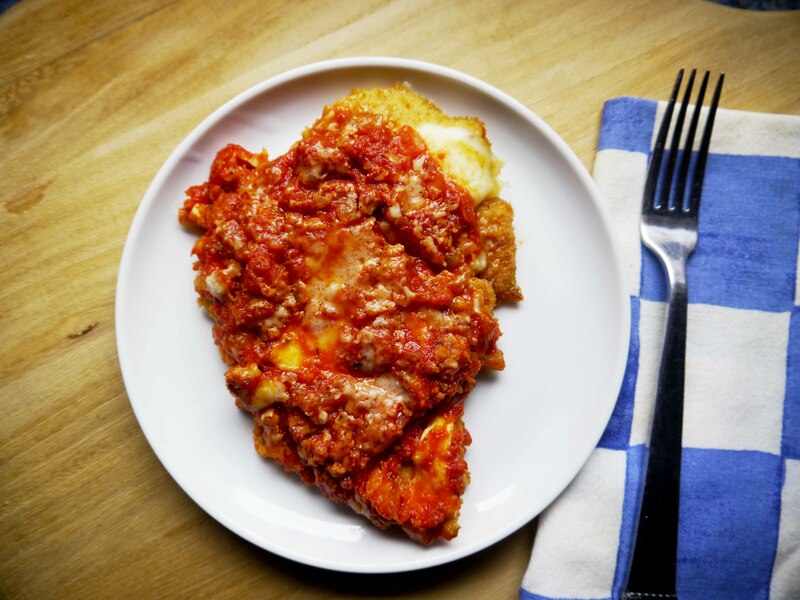 This dish is similar to eggplant parmesan but without the cheese and without as much work. 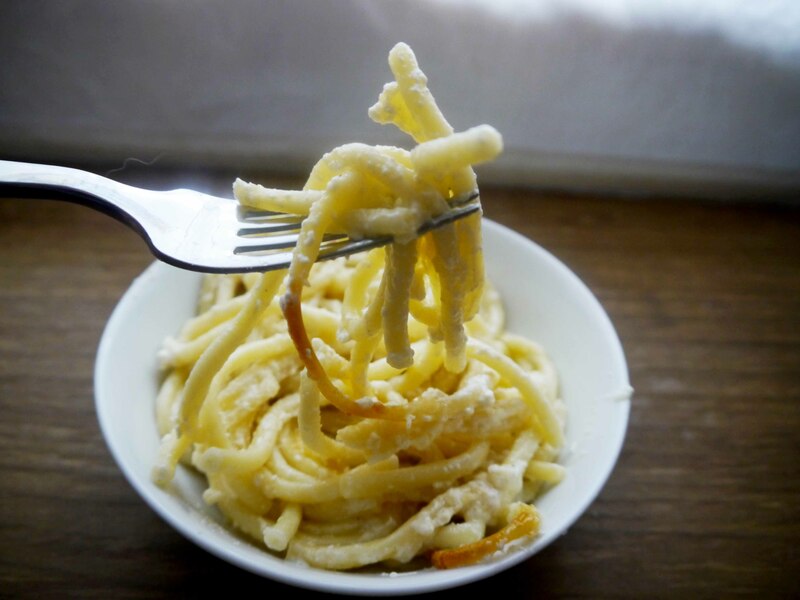 It is, however, as delicious as that Italian favorite. And a dash of cinnamon sends it to another world. 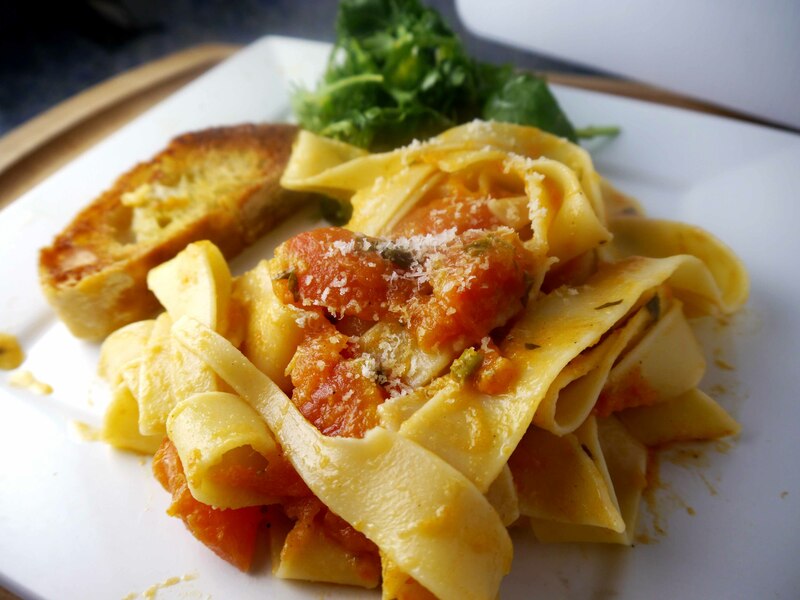 The tomato sauce is pretty easy to make. 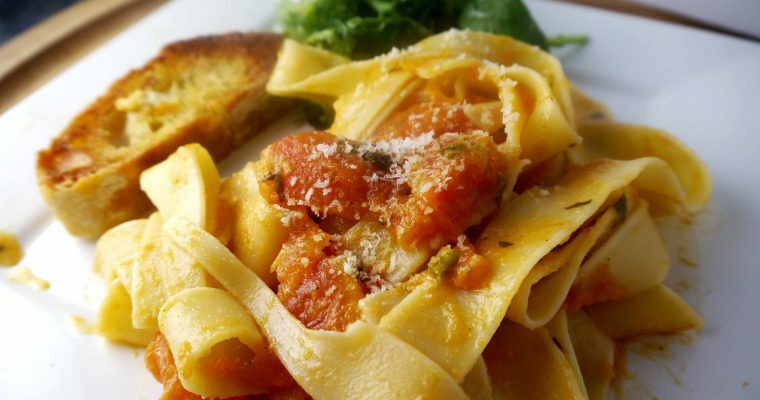 Use a box of chopped tomatoes. This is a take on the classic Turkish dish, Imam Bayildi (which translates to “the imam fainted”). 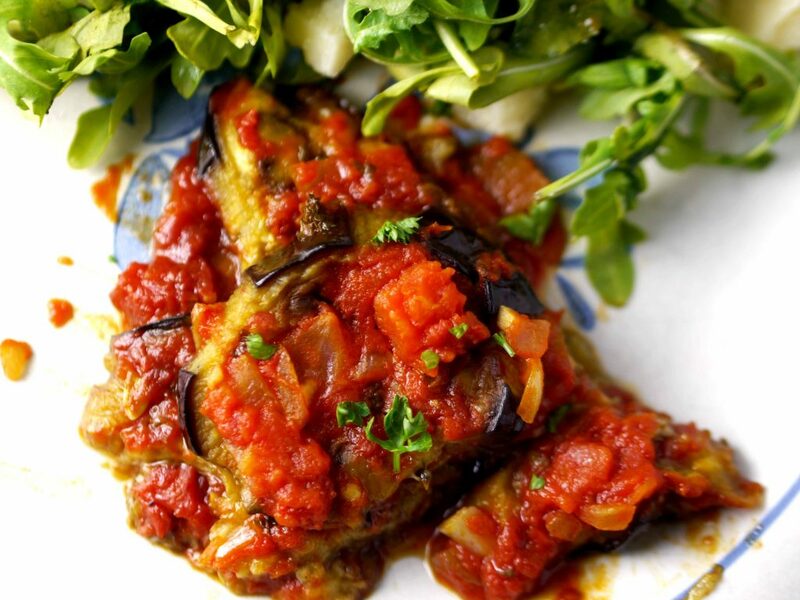 The classic dish is a stuffed eggplant but here you slice the eggplant and then layer it instead. 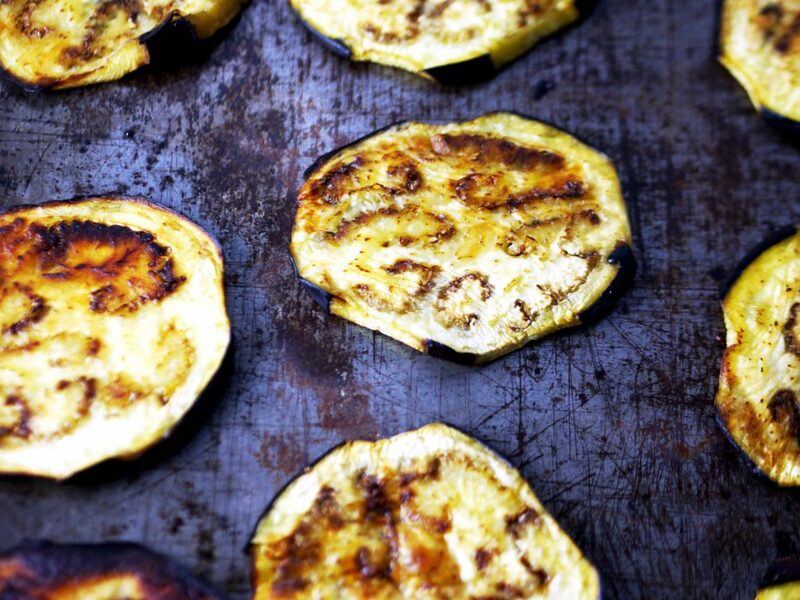 Brush the eggplant slices with some olive oil and bake them in a hot (425 degree) oven. 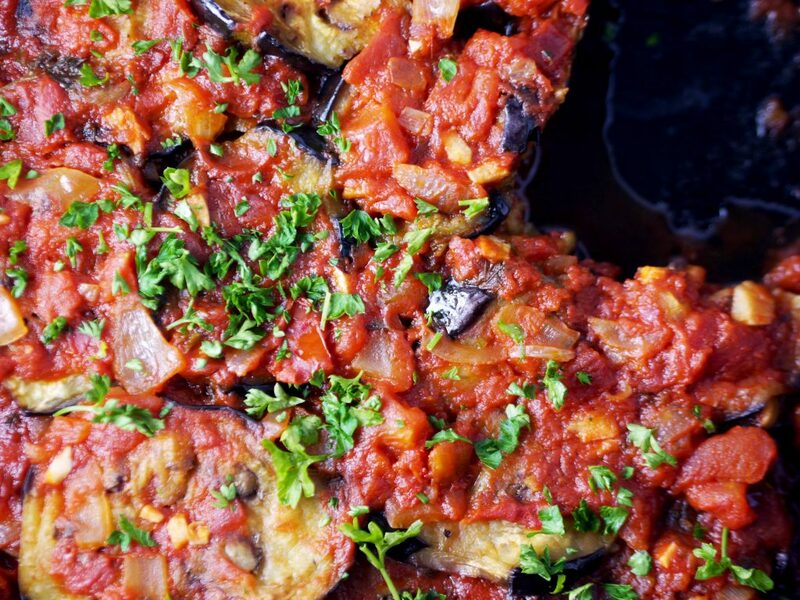 Other casserole versions of this recipe call for frying the eggplant and if you do that you can get away with using just one pan to create this dish. However, I found that baking the eggplant slices is just as good and probably less calories. It does, however, require you dirty an additional two cookie sheets. Slices of this pair well with a simple arugula salad. Most eggplant recipes tell you to salt the eggplant slices to get the bitter juices out. I’ve found this to be a myth and contrary to popular belief believe salting it may actually add some bitterness. I know there are plenty of grandmothers out there who recommend salting eggplant but this only makes the eggplant mushy. I’ve found that the best way to avoid making bitter eggplant is by carefully selecting the eggplant. Look for one that is a dark, purplish/black color. It should be firm without any scarring and without any soft spots. Next, I recommend peeling the eggplant, leaving purple vertical stripes. If you use a cast iron skillet to make the sauce you can layer the eggplant in it and then bake it in the oven (using only one pan). I based this recipe on one I found on the “Feed Me Phoebe” blog. Phoebe describes herself as a gluten-free chef, obsessed with finding the sweet spot between health and hedonism. 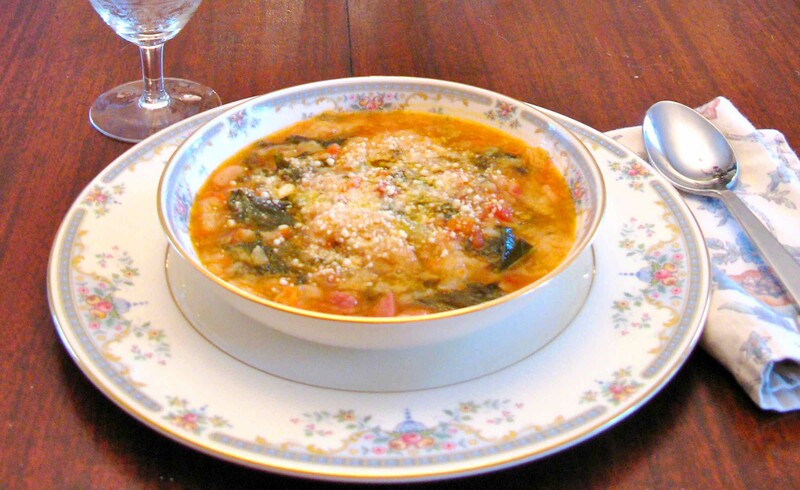 And I can attest that this casserole feels very indulgent while you’re eating it. 1 large eggplant or two medium eggplants (I don’t salt it as recommended in the original recipe as I believe that makes it more acidic. 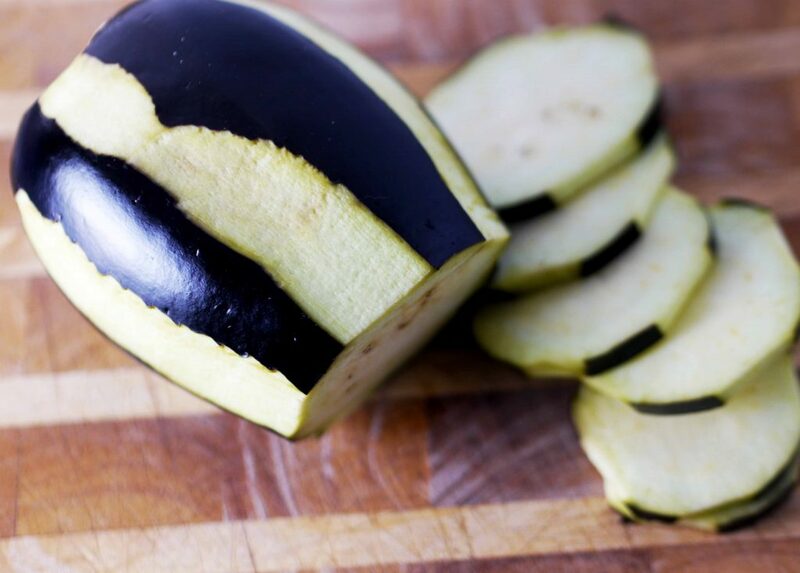 Instead, be careful to select a very firm eggplant with little or no blemishes. The color should be a deep purple. And then peel it vertically in strips so that it looks like it has thin purple stripes before you slice it into 1/4-inch slices, horizontally. About 27 oz of diced tomatoes from a can or box. Step 1 Take eggplant slices and brush olive oil on both sides. Put them on a cookie sheet that has been drizzled with a little olive oil (to prevent sticking). Step 2 Bake slices in batches on two cookie sheets. When one side has turned brown, flip them over the bake on the other side. This should take about 10-15 minutes per batch. Step 3 Heat a little olive oil in a cast iron skillet. Step 4 Add onion to skillet and cook until soft (about 5 minutes). Add the garlic, chili flakes, 1/2 teaspoon sea salt and cinnamon. Cook for one minute more, until fragrant. 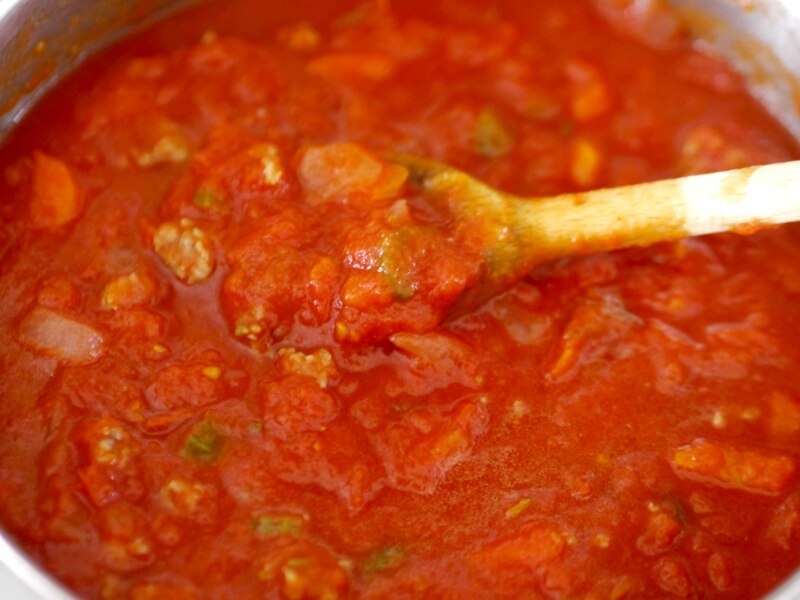 Carefully pour in the tomatoes and simmer until thickened slightly, about 5 minutes. Remove from the heat and stir in half the parsley. 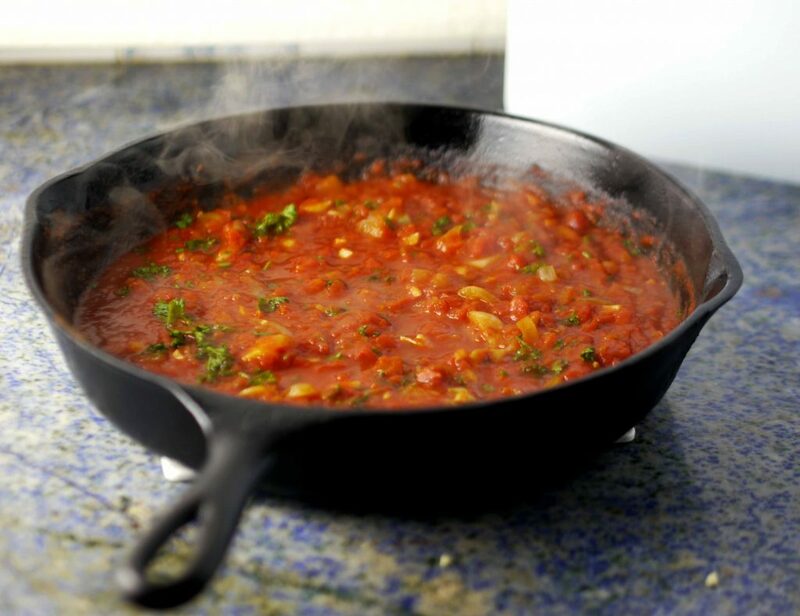 Step 5 Remove most of the tomato sauce from the pan, leaving only a thin layer (about 1/4 cup) spread evenly over the bottom. 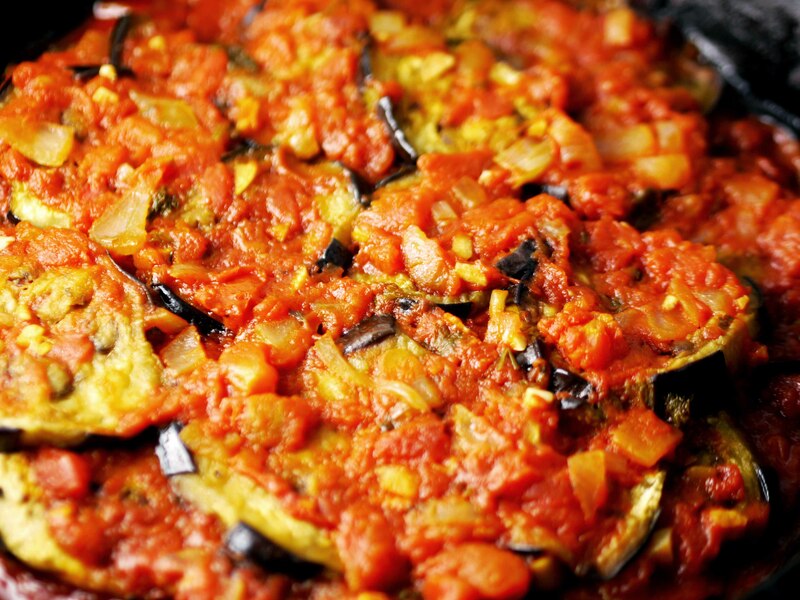 Add one layer of the eggplant in the pan over the sauce and then top with more sauce. 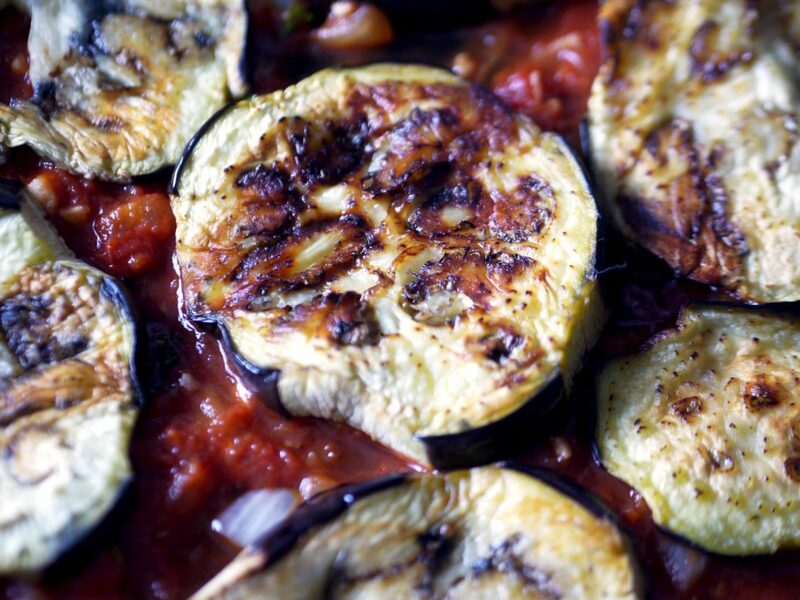 Continue to add layers of eggplant and sauce, as if you were building a lasagna. Step 6 Cover with foil and cook in the oven for about 45 minutes until eggplant is soft and sauce is reduced. Garnish with remaining parsley and let it rest for about 10 minutes before slicing it. 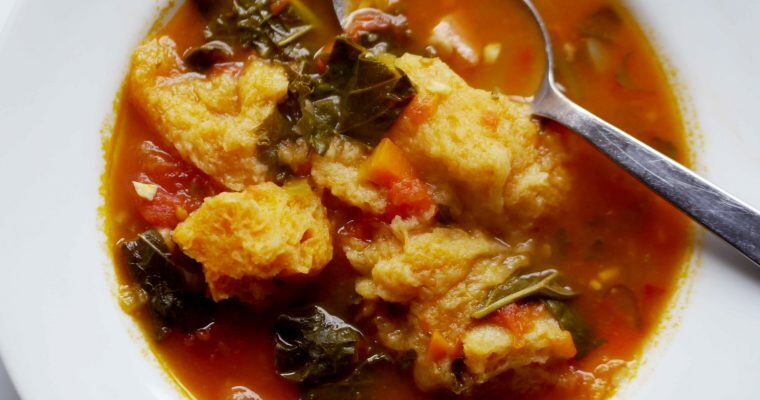 You can serve it warm or at room temperature.